Black tea typically has the most caffeine of all the tea types. One of the reasons for this is a longer infusion time versus green along with higher steeping temperatures, typically boiling. Because black tea is oxidized, it allows more caffeine to be extracted from the leaf versus other types of tea. There are other influences that can alter the caffeine content, including which part of the plant the leaf comes from, altitude and local conditions, leaf grade, type of tea, fertilizer used, and much more. As a general rule, the Assamica tea variety is higher in caffeine than other varieties. These are teas grown in India, Africa and Sri Lanka. Assam is a classic example of this tea variety. The Chinese "camelia" variety of tea leaves tend to be lower in caffeine. Lapsang Souchong is made from lower, older tea leaves, and thus it is amongst the lowest in terms of caffeine content. Older bushes, typically found in certain areas of China also result in lower caffeine levels. Some shade grown green teas like Gyokuro tend to have higher caffeine levels than their non-shaded cousins. So, does black tea always have the highest caffeine content? Because there are a myriad of ways caffeine is measured and when it's measured - it's hard to say which tea variety has the absolute highest and lowest amount of caffeine. There are literally dozens of factors that make up the caffeine content in tea, and any tea company can seize one aspect and declare that this is the highest caffeine tea you can buy, when it might be taking data from a particular moment in time that is 'ideal' but changes later when it is being processed. At the end of the day - drinking black tea will yield the highest caffeine as a rule of thumb, with green and white teas having lower amounts. Will there be enough variation between one type of black tea versus another to make a noticeable difference? Probably not. And don't forget, there are other components in tea that affect how caffeine is processed within your body. EGCG, L-theanine are found in tea in varying amounts - and these too can increase concentration and awareness without giving you a caffeine jolt and crash. The one benefit to drinking tea is that there are lower overall amounts of caffeine, allowing you to drink more. Daily recommended caffeine should be about 400 milligrams, which is 4 "cups" of coffee, but cups being 8 ounces, it really means 2 large cups to a lot of people. With black tea coming in around half the caffeine as coffee (45 per cup versus 90 for coffee) you can enjoy a lot more tea throughout the day. What about Green, White and Oolong teas? While the chart above provides you with general numbers, in reality all teas and coffees will have a range. 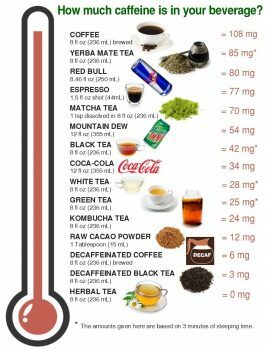 So for example, white tea may say 28mg of caffeine, it is more like 10-30mg, and that depends on the type and variety used. Silver Needle will be on the upper end of the range versus Pai mu Tan, or if the tea contains other ingredients like fruit pieces.